After years of waiting, Tommy Wiseau has finally set his next directorial project following his infamously terrible cult classic, The Room. 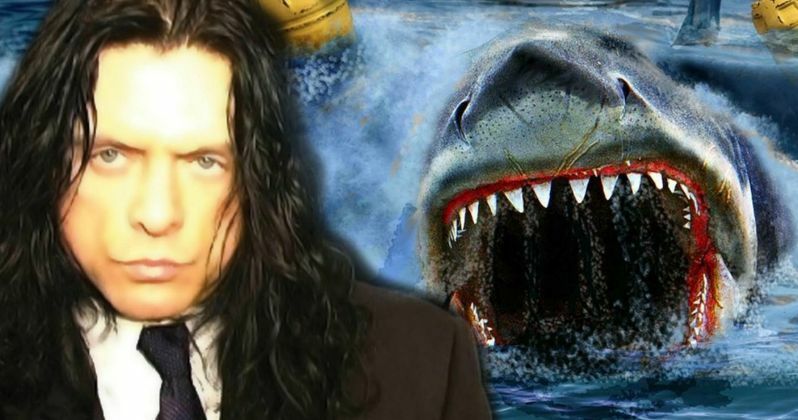 Wiseau will next helm and star in a giant shark movie set in New Orleans, appropriately titled Big Shark. The movie will reunite him with his The Room co-star and real-life best friend Greg Sestero. What's more is that a teaser was recently shown for the upcoming movie for the first time ever and, though the quality isn't great, it has leaked online to verify that this is, indeed, a real thing. Unfortunately, the teaser that has leaked online is of poor quality and doesn't contain all of the footage shown at the event. But we do see the core stars and, most importantly, a shot of the gigantic shark monster. The full teaser sees Patrick (Tommy Wiseau) introducing his buddies Tim (Isaiah LaBorde) and Georgie (Greg Sestero) to a couple of women in a restaurant. Things don't go over very well as they both call Georgie a jerk, slap him and they all move on. The trio then walk back to their car and that's where the teaser that has leaked online picks up. The streets begin to flood and, shortly, they're up to their hips and in the background, a poorly animated CGI shark eats someone. Then the shark comes for them. They bolt and the title card comes up before the titular monster swims at the screen. Related: Big Shark Poster: Can Tommy Wiseau Save New Orleans from This Great White? Tommy Wiseau is a famously mysterious figure. He self-financed The Room and, though he had no experience, wrote and directed the movie himself, which reportedly cost $6 million to produce. Since then, the movie has attained cult status for being legendarily terrible, but it regularly sells out screenings all over. The Oscar-nominated The Disaster Artist chronicled the making of the movie and helped further propel its fame. The Room was initially released in 2003 and Wiseau hasn't directed a movie since. Though, he and Greg Sestero did star in Best F(r)iends last year. The plan is reportedly to shoot the movie this year and they apparently intend to premiere it in September, making for a quick turnaround. It's unclear at the present time who is financing the project or where it will ultimately end up, but this is real and it's happening. Be sure to check out the teaser for Big Shark below. We'll be sure to keep you posted as any further details are made available. This news was first reported by Film Futter.